Pro-Collagen Overnight Matrix 30ml e 1.0 US fl. oz. The day-to-night edit for younger-looking skin. Refresh your skin routine with our exclusive day to night edit. This season’s essential capsule collection features cult classics – the PRO-COLLAGEN MARINE CREAM and ADVANCED EYE TREATMENT – with a modern twist, the indulgent OVERNIGHT MATRIX. Spring is all about aquamarine, as ELEMIS super seaweeds and pioneering SMART DRONE PEPTIDE TECHNOLOGY™ are paired to target the effects of time. Effortlessly style our best-selling Pro-Collagen skincare staples day and night for fresh, stress-free skin and self-confidence. Clinically proven*, the powerful anti-ageing ingredients have been shown to reduce the appearance of wrinkles and improve skin firmness, tone and hydration in 14 days. 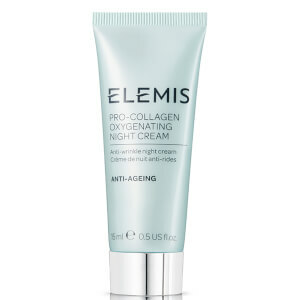 Firming Padina Pavonica and anti-oxidant rich Ginkgo Biloba improve skin suppleness and elasticity, thus creating the ultimate anti-ageing cream from ELEMIS. 2 NOURISH and REPLENISH Night: PRO-COLLAGEN OVERNIGHT MATRIX 1.0 US fl. oz. This clinically proven* overnight treatment with ELEMIS’ Smart Drone Peptide Technology replenishes the complexion giving smoother looking skin, with visible bounce-back. This advanced eye serum, with Padina Pavonica and Blue Flower Linseed, targets the fine lines and wrinkles around the delicate eye area, smoothing skin for a more youthful looking appearance. Lightly pat two drops around the eye area, morning and evening. Day Cream: Apply every morning to cleansed, dry skin. Night Cream: Warm a pea-sized amount between the palms and smooth over the face. Eye Treatment: Dispense one to two drops onto the ring fingers and lightly pat around the eye contour. Marine Cream: Aqua/Water/Eau, Glycerin, Caprylic/Capric Triglyceride, Glyceryl Stearate SE, Isononyl Isononanoate, Dicaprylyl Carbonate, Dimethicone, Triticum Vulgare (Wheat) Germ Oil, Butyrospermum Parkii (Shea) Butter, Chlorella Vulgaris Extract, Padina Pavonica Thallus Extract, Daucus Carota Sativa (Carrot) Root Extract, Porphyridium Cruentum Extract, Acacia Decurrens (Mimosa) Flower Extract, Rosa Centifolia (Rose) Flower Extract, Ginkgo Biloba Leaf Extract, Tocopherol, Phenoxyethanol, Polyacrylate-13, Stearic Acid, Tocopheryl Acetate (Vitamin E), Coco-Caprylate/Caprate, Cetyl Alcohol, Xanthan Gum, Glyceryl Polyacrylate, Polyisobutene, Fragrance (Parfum), Citric Acid, Chlorphenesin, Glyceryl Acrylate/Acrylic Acid Copolymer, Sodium Dehydroacetate, Disodium EDTA, Polysorbate 20, Sorbitan Isostearate, Hydroxyisohexyl 3-Cyclohexene Carboxaldehyde, Butylphenyl Methylpropional, Linalool, Citronellol, Potassium Sorbate, Sodium Benzoate, Citrus Limon (Lemon) Peel Oil, Cuminum Cyminum Seed Oil, Cedrus Atlantica Bark Oil, Limonene. Overnight Matrix: Aqua/Water/Eau, Glycerin, Olus Oil/Vegetable Oil/Huile Végétale, Propanediol, Behenyl Alcohol, Squalane, Butylene Glycol, Octyldodecanol, Dicaprylyl Carbonate, Helianthus Annuus (Sunflower) Seed Oil, Phenoxyethanol, Acrylates/C10-30 Alkyl Acrylate Crosspolymer, Beheneth-25, Glyceryl Acrylate/Acrylic Acid Copolymer, Benzoic Acid, Lavandula Angustifolia (Lavender) Oil, Disodium EDTA, Dunaliella Salina Extract, Rhizobian Gum, Sodium Hyaluronate, Dehydroacetic Acid, Linalool, Lavandula Hybrida Oil, Pelargonium Graveolens Flower Oil, Padina Pavonica Thallus Extract, Geraniol, Eucalyptus Globulus Leaf Oil, Chlorphenesin, Plankton Extract, Anthemis Nobilis Flower Oil, Citronellol, Potassium Sorbate, Sodium Benzoate, Caramel, Cinnamomum Camphora (Camphor) Wood Oil, Limonene, Mentha Arvensis Leaf Oil, Tocopherol, Xanthan Gum, Caprylyl Glycol, Citrus Aurantium Dulcis (Orange) Oil, Fragrance (Parfum), Tephrosia Purpurea Seed Extract, Vitis Vinifera (Grape) Seed Oil, Menthol, Eugenia Caryophyllus (Clove) Leaf Oil, Sodium Hydroxide, Glyceryl Caprylate, Lactic Acid/Glycolic Acid Copolymer, Phenylpropanol, Palmitoyl Tetrapeptide-50, Polyvinyl Alcohol, Heptapeptide-15 Palmitate. Eye Treatment: Aqua/Water/Eau, Propylene Glycol, Glycerin, Oryza Sativa (Rice) Hull Powder, Ammonium Acryloyldimethyltaurate/VP Copolymer, Sclerotium Gum, Diazolidinyl Urea, Sodium Benzoate, Sodium PCA, Disodium EDTA, Sodium Lactate, Potassium Sorbate, Arginine, Aspartic Acid, Hydrolyzed Wheat Protein, PCA, Centaurea Cyanus (Cornflower) Flower Extract, Linum Usitatissimum (Linseed) Seed Extract, Hydrolyzed Hyaluronic Acid, Glycine, Alanine, Aesculus Hippocastanum (Horse Chestnut) Seed Extract, Serine, Valine, Linalool, Caramel, Threonine, Isoleucine, Proline, Fragrance (Parfum), Anthemis Nobilis (Chamomile) Flower Oil, Lavandula Angustifolia (Lavender) Oil, Lavandula Hybrida (Lavandin) Oil, Osmanthus Fragrans Flower Extract, Phenoxyethanol, Histidine, Phenylalanine, Sodium Hydroxide, Padina Pavonica Thallus Extract.